A proven principle of marketing is: repeated impressions breeds remembrance, which breeds results. Place based displays located where particular groups congregate for a variety of purposes such as the restrooms of restaurants and nightclubs, in the common areas of health clubs and bars, on college and high school campuses, in arcades, in doctors’ waiting rooms, golf courses and, of course, in your parking lot one of the most effective ways to reach your audience. 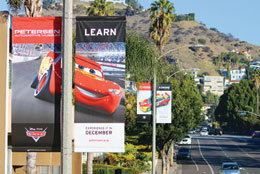 The repetition of your message on attractive parking lot banners will reach consumers many times – not just once. And that is what you want from your advertising. Parking lot banners unleash the power that is right in your own backyard. Customers who live and work no more than a 5 to 10 minute drive from your location are where the overwhelming majority of your best customer’s come from. Closing the sale begins with attracting those customers to your parking lot because nobody will know how great your products, services, and people are until they come into your store. Your parking lot banners can be used to reach your potential customers more effectively than any other form of advertising. Begin that first step with light pole parking lot banners that consistently attract the attention of diverse commuters, visually communicate success, and bear customized messaging from branding to special deals. There’s nothing else like them. As the industry leader and largest provider, we have the experience and expertise to make your campaign high impact and hassle-free. 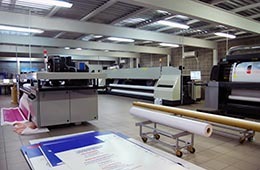 With our turnkey approach, quality production process, customer service focus, and reputation for delivering results, our success is yours. 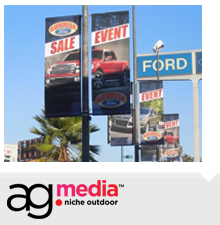 Make AGMedia’s light pole parking lot banners part of your next campaign to boost your sales. 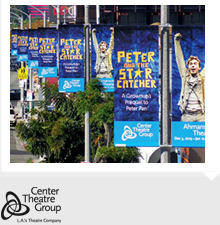 What are parking lot banner programs? 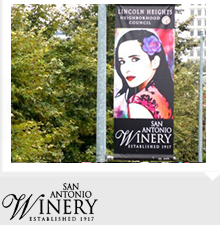 Light pole parking lot banners are a dynamic form of outdoor advertising that can create a memorable impression. 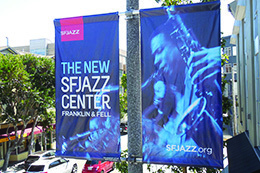 Used by businesses to attract new passing customers or inform regular customers of special offers – light pole banners are distinctive, inviting, and unforgettable. As a means to spread a consistent message to the masses they capture the attention of drivers and they can bring a cohesiveness to your parking lot with eye-catching displays and graphics that practically jump off the pole. How can AGMedia parking lot banner programs help promote your business? Aside from being one of the most cost effective form of popular outdoor advertising, one of the key selling points of parking lot banner programs is that you can have virtually any type of design or message on your banners. AGMedia has a seasoned creative team capable of creating artwork that represents your branding and event at the highest level. We offer a turnkey approach from start to finish, and we are dedicated to making the process smooth, successful and cost effective and handle each outdoor advertising project every step of the way.